Several companies have already announced plans for their own electric trucks. Tesla recently unveiled its electric semitruck. So how does it stack up to the competition? The Tesla Semi is a standard Class 8, the largest commonly used class of heavy-duty freight trucks. 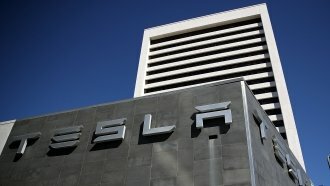 Tesla CEO Elon Musk said it can travel up to 500 miles on a single battery charge and will reload via Tesla "megachargers." And he guaranteed the truck will have a lifespan of about a million miles. But while this vehicle might seem impressive, the electric truck market is already competitive. Several other companies have recently unveiled their own vehicles. Daimler's E-FUSO Vision One is an all-electric heavy-duty truck that can travel almost 220 miles on a single charge — not nearly as far as Tesla's. But the company does already have a deal with UPS. Bosch and Nikola Motor teamed up to develop a long-haul hydrogen-electric truck, which could be released as early as 2020. The companies claim it will have a range of 1,200 miles. Startups are also entering the game. Swedish company Einride, for example, is developing a remote-controlled all-electric rig system for its semitrucks. The vehicle can travel up to 125 miles on one charge. And while Musk promoted the Tesla Semi's autopilot feature, that's not unique, either. Daimler has been working to make its trucks autonomous for years. And Einride's vehicles wouldn't even have a driver's cab. Although those other trucks didn't get Tesla's flashy rollout, production on the Tesla Semi doesn't begin until 2019. So we'll have to wait and see if it can truly stand out from the pack.